November 1st came in like a snowy winter wonderland! It is so pretty now and it feels like Christmas. In truth Christmas is just around the corner. But first, Thanksgiving! We have so many things to be thankful for. We had a great month with 2 retreats. I am so thankful for the friendships we have with all who attend and thankful that they want to come back time after time! I am thankful for the beautiful fall days we had in October. The colors were amazing this year and even though the season seemed all to short, I did not want to take any of the days for granted. I am thankful for these ladies! 30 % off your fabric. The discount only applies if your top is present and only for the amount of fabric you will need for your back. We can even help you figure out what you need. 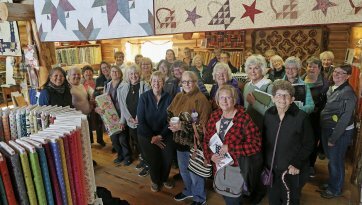 So gather up those quilt tops and come find a back for them! They are lonely! We have have many new fabrics that have come in. Starting with Hoffman, the Hoffman Challenge "Shine On" fabric is here along with a few go withs! We also have the digital print moose and bison panels. There are some new digital prints from Kaufman as well. We have "Spirit Animal" by Tula Pink. We love her! We have her "Way Finder" kit as well. 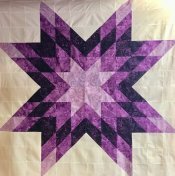 Our "Meet Me in Montana" Row by Row kit is now on our web site! Go to the shopping page and then to kits. The lettering is pre-cut and pre-fused! We also have our Row by Row Jr. This could be a perfect project to do with a young sewer during the holidays! 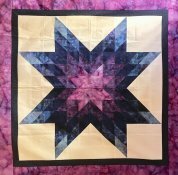 This month's quilt looks like a Lone Star but it is made using only half square triangles! You can change the size by changing the size of your blocks! Sharon's samples are beautiful!